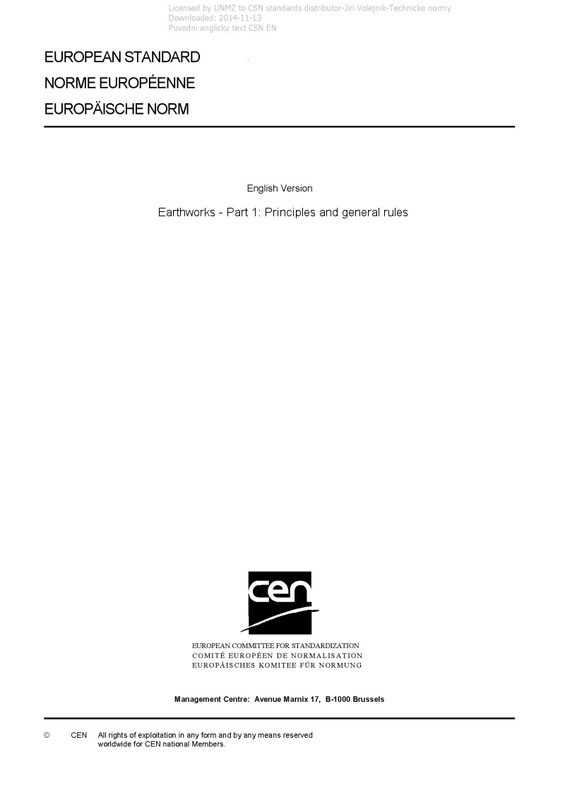 EN 16907-1 Earthworks - Part 1: Principles and general rules - This European Standard (Part 1) gives definitions, principles and general rules for the planning, design and specification of earthworks. It introduces the other parts of the standard, which will be used together with Part 1. Earthworks are a civil engineering process aimed at creating earth-structures by changing the geometry of the earth surface for construction or other activities. Application fields of earthworks are associated with: - transport infrastructures (road and motorways, railways, waterways, airports); - platforms for industrial, commercial and residential buildings; - water engineering, flood defence and coastal protection works; - harbours and airport areas, including the construction of embankments in water; - river dykes and marine embankments for land reclamation; - earth and rock fill dams; - onshore embankments made of hydraulically placed fill; - noise barriers, visual barrier, and other non-load bearing earthworks: - landscaping embankments; - backfilling of open mines and quarries; - tailings dams; They are characterized by the need to use available natural or recycled materials and to handle them in a way appropriate to yield prescribed properties. This standard is applicable to all types of earth-structures, except the cases listed below: - some specific types of works such as the execution of trenches and small earthworks may be organized using simplified or specific rules; - some structures, such as dykes and dams, need earthworks which have specific design and construction requirements: these may extend beyond the rules of this standard. This standard does not cover ground improvement beneath an earth-structure by techniques such as piling, jet grouting, deep soil mixing, vertical drains or stone columns. Due to the variable subsoil and climate conditions within Europe and to the different national contract conditions, national sets of rules have been established in several European countries which could not be harmonized within a short period by a European Standard. This European Standard gives therefore basic rules to reach the aims described above. Informative Annexes B to H of this document give examples of national practices following these rules.